OK, so we did get to finally have the Cornerstones of Rock show shown here in Lincoln, but while I watched it, I kept thinking there were a few songs here and there that were missing. I checked my DVD and sure enough, the Chicago WTTW broadcast of the event was longer than the pared down national PBS show. SO, their pledge promises NOW fit correctly, even 'tho done back six months ago in Chicago. NOW, the national showing deletes seven songs shown on WTTW's broadcast, so their advertising is correct for the current show offering bonus material not shown on the broadcast. We original buyers still got a bit ripped off, but current buyers WILL get what is promised. AND FH member and friend and one of the Shameless girls who was there in the 60's and still stays in touch will these Chitown faves, Marlene O'Malley, is featured TWICE (same clip both times) in the national promotion -- once in the show and once in the pledge rap videos. Marlene, you are a national star!!! Ahhh ... so see, they DID find a way to "make things right" ... by not doing anything at all except cut even MORE footage from the program. (I'd be curious to see how the nationally syndicated version plays ... obviously a lot "tighter", I'm sure ... it'd be cool to check the continuity. I'm sure in some diluted way PBS figures "less is more" ... now they can squeeze in an even higher pledge-time ratio and get more money for the station by shipping what appears to be "additional bonus footage" on the dvd's they already have in stock, ready to ship). Maybe that'll fool most of the people. However, we've already heard from readers like Tom Cuddy, who caught the show in New York City, and asked "Didn't The New Colony Six do 'I Will Always Think About You'?" Of COURSE they did ... it was their biggest, #1 Hit here in Chicago (although "Things I'd Like To Say" charted higher nationally) ... but BOTH were National Top 20 Hits!!! 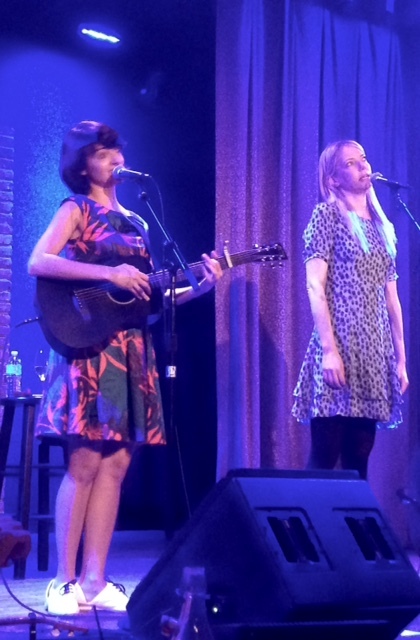 So glad you got to see the show, and I agree with you about the stripped down versions. Everyone here was shocked, too, when they left off some of the biggest songs! Too bad, cuz they were all so great! And you're so funny, with your Shameless plug! I still can't figure out why that camera caught me and not some of the other fans ... although I was probably singing along more than most others! But again, I'm really glad you were able to catch the show. They're doing it again this weekend at the Arcada Theater in St. Charles ... and yeah, I'm going again!!! Man, I gotta start saving money for my old age!!!!!!! Thank you for mentioning Jimy Sohn's Birthday, August 23rd!!! It really hasn't been made clear about Jimy and the Original Shadows of Knight Concert that was to happen this month? Jimy is the GREATEST and me along with his MANY FANS hope he is healthy and recuperating from his stroke. I wasn't really clear about the reunion show either ... I swear I saw as many as three different dates and two different venues listed at various times ... so I thought maybe they were doing multiple shows together. As of now, no others have been planned. I will be performing Saturday, September 3rd, as part of the Cornerstones show at the Arcada. Earlier this year we featured a Monkees salute as one of our monthly Sweet 16 features ... the songs we felt were the most timeless and best defined the band. It still makes for some VERY entertaining reading, however, as you hear it from their side. Regarding Dave Holliday, please let Jeff Tesch to check the comments under this Wayne Cochran YouTube video. You'll see that Dave Holliday posted there. I am a collector offering top price for RW issue of March 23, 1968 if you might have a source. New York, NY -- On October 14, 2016, Eagle Rock Entertainment will release Wembley 1996 Live by Bryan Adams on DVD and Digital [MSRP $15.98]. Wembley 1996 Live is a legendary show for Bryan Adams fans, finally being released on DVD for the first time. With Bryan Adams touring in the US and Canada this September, there is no better time to reconnect with this fantastic performer. See www.bryanadams.com for more details regarding tour dates. Celebrating 50 Years of Good Vibrations! 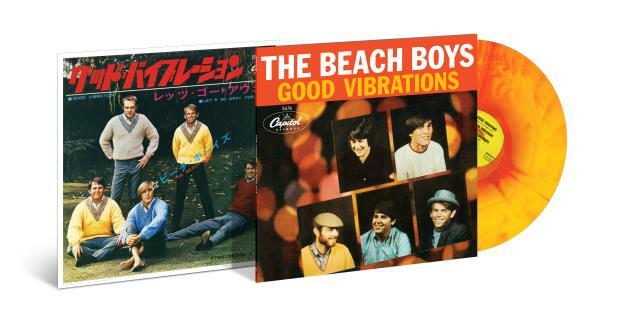 The Good Vibrations (50th Anniversary Edition) vinyl EP features the original 7" single version, an alternate studio take, an edit of the song with elements from various sessions, an instrumental, and a live version from a Honolulu rehearsal in August 1967 that was originally intended for the lost album Lei'd in Hawaii plus the single’s B-side, "Let's Go Away For Awhile." A pull-out lithograph of the single’s original Japanese cover art, with its "Good Vibration" title typo intact, is included in the EP package, which features the original 1966 U.S. single cover art on its front. Who ironically died of emphysema. Well while I'm waiting for midnite for the Sunday Comments to post, I thought I'd make mention that roughly ten months after the show took place, The Cornerstones Of Rock PBS show is finally airing here in Southern Illinois. Both PBS stations here are airing it, one after the other. I'm seeing it for the first time. I am soooo glad I saw this live. If this show is all you could see, I would be pissed. The DVD is OK, as it has more stuff on it. My advice to everyone out there, as I believe it's airing in a lot of markets this week, is spend the money on the extras. You're still missing some great stuff, but this was a one of a kind show. My advice to WTTW, is go hire some decent sound engineers and tape editors, as well as someone who knows the music. I gotta tell you, I'm not sure how I found out about the show to begin with, but I never typed so fast in my life to get tix. I'm so glad I went. Urge your readers to pop for the entire package. Whoever decided what segments shout air, and what shouldn't, should be tarred and feathered. Too many glaring omissions. Oddly enough the national airing of this program was our lead story in this Sunday's Comments Page! I caught the Indiana PBS broadcast last week and Jim Peterik was there in the studio during the beg segments. Wonder who's doing this on a national level. YES, I was surprised to see the Cornerstones concert on following the Surf oldies PBS show last night! Oddly, it had the same pledge rap stuff with Peterik and Giammarese in our Nebraska airing as was on the Chicago one. 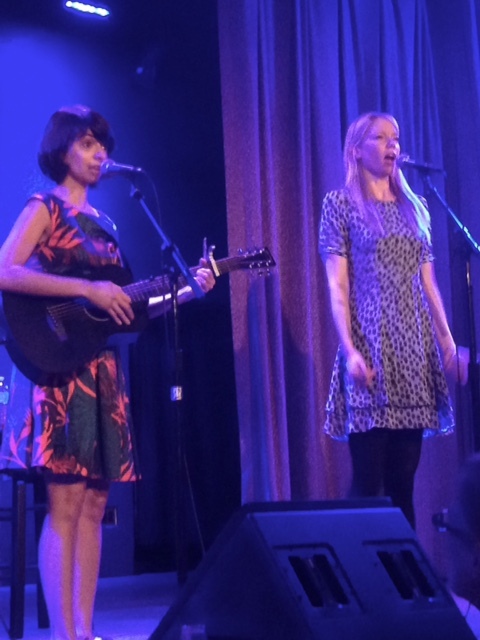 Thus, the pledge show also again erred in saying the DVD would have seven extra songs not on the show. I watched it again and just felt bad that we could not see the whole show still today in any format. 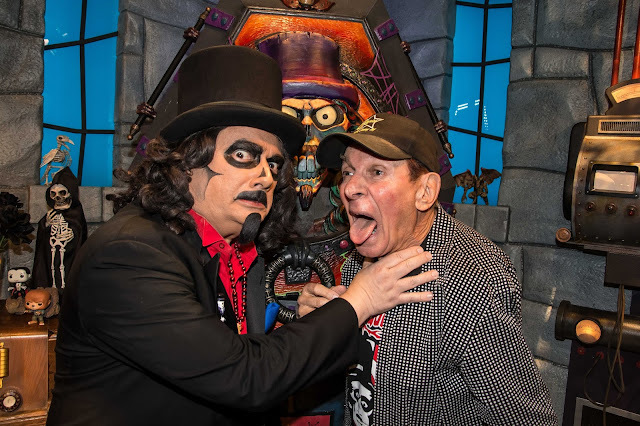 Did anyone ever send info on how the Shadows of Knight reunion show went? Would love to know. I really enjoyed the Cornerstones concert but wish it included more songs. Didn't the NC6 perform “I Will Always Think About You” during the taping? Ken Evans of The Fifth Estate here. Saw The Cornerstones of Rock show on TV last night here on the East Coast. Enjoyed it totally from top to bottom ... can't say enough about it. Thought all the bands sounded great. It's a top notch show and I hope it hits many more TV markets around the country. I'm sure it will and should - it's that good. It reminded me very much of the type shows we were often out with in those mid to late 1960s years. Especially one tour for the summer of 1967 with The Music Explosion, us (The Fifth Estate), The Buckinghams, The Easybeats, The Happenings, and Gene Pitney. All had hits in the top 20. This was one of if not the biggest pop / rock music show out that year - the year following The Beatles retirement from touring. It filled coliseums and even some football stadiums across the country. It was totally great to see Dennis sing again with The Bucks, particularly with Nick and Carl. Although all the others played great, I nevertheless miss Marty and Jon Jon being out there. Seems like yesterday to me anyway, and the Cornerstones show really brings all that and a lot of great music from that period back! All the bands were cool and beautiful!! Not bad for 50 years on almost - MAN !!!???? Last week was Jimy Sohns' (Shadows of Knight) birthday. Happy Birthday, Jimy Sohns! (8/23/1946 ). Here's a vintage clip of Jimy with Wolfman Jack. Lou Christie himself had a “Shoulda Been A Hit” ... “If My Car Could Only Talk”. That shoulda been a hit!! Here is a release that Freddy Cannon wanted you to have first. It will be released to the mainstream press on Tuesday. 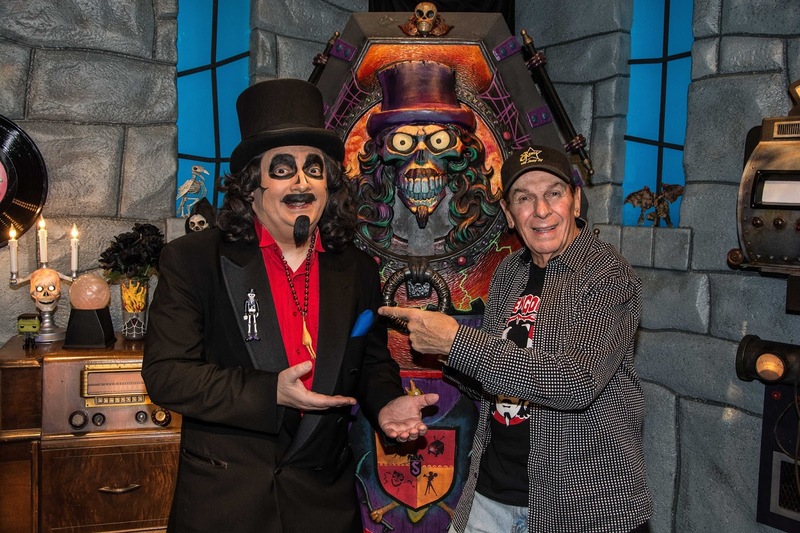 Svengoolie will introduce the new tune during his showing of Lon Chaney in “Frozen Ghost” this Saturday, Sept. 3rd, 10 pm, (9 pm, central) on ME-TV. Don’t forget (year unknown but), "It was the third of September, the day I'll always remember, yes I will 'cause that was the day that my daddy died," according to the Temptations' Papa was a rolling stone. When I played in a band (called the "Banned") in the summer of 1968 at the Chez Lounge, an after hours dive in Waukegan, IL, I met a very talented musician who played keyboards and guitar. His name was Dave Holiday (not sure if that's the correct spelling of his name) and I believe he was from Texas. He claimed that he had actually written "Going Back to Miami" when he played in Wayne Cochran's band briefly. Although I only knew Dave for a few weeks, he taught me many of the "jazz" chords on the guitar that I still use. 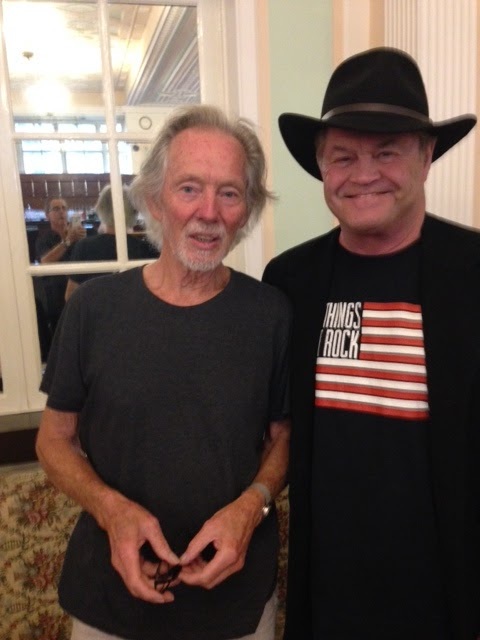 He seemed to be a pretty straight shooter and I believed his claim about having a hand in the writing of that song. I have no idea what became of Dave Holiday after 1968 but he was a huge influence on my musicianship. I have searched the internet for info on members of Cochran's C.C. Riders but I haven't found anything more informative than your blog which is several years old now. Just thought I would throw out an email to see if anybody might have more information about this. Thanks for running the blurb about my new Tiki Lounge release ... very nice! As you know, Joe Klein and I go back to 1977 when I recorded in his studio! I remember him doing sessions with Bobby Kimball ... those were the days. I met Linda Carter (Wonder Woman) at Joe's studio when I was recording 'Calling From A Star". I'm still rockin' after all these years and consider myself fortunate to do so. Last year's two CDs ("50th Anniversary" and "King of the Fuzz Guitar") are probably the last of the Arrows' physical albums. This new one (titled "The mini Album" ... only 7 tunes) is for "downloads only". Memphis, TN - The Summer of 2017 marks the legendary Memphis blue-eyed-soul group THE BOX TOPS’ 50th anniversary of the release of their worldwide #1 smash hit debut single “The Letter.” To celebrate, they anticipate extensive touring and perhaps a new album that could include obscure never-issued tracks from their 60s heydays, with Alex Chilton on lead vocals. After THE LETTER, the group charted with other hits, including NEON RAINBOW, CRY LIKE A BABY, and SOUL DEEP. 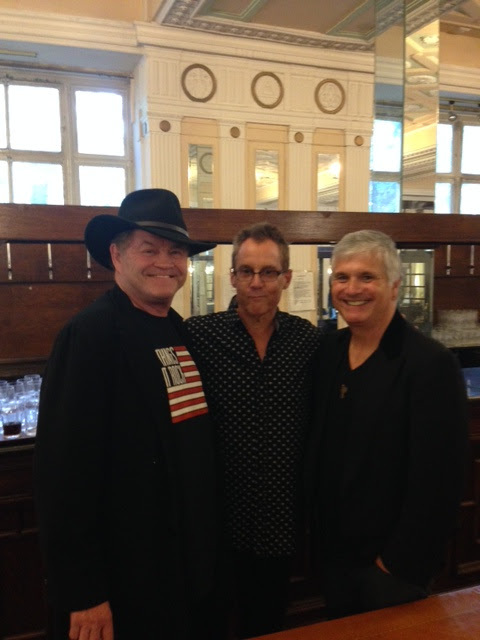 New York – Micky Dolenz, on a quick break from The Monkees’ ongoing Good Times tour, was in Liverpool for the recent International Beatleweek festival. Seen here with Micky are (photo 1 / L - R) Micky’s musical director Wayne Avers and guitarist Lawrence Juber; and, (photo 2) with Klaus Voorman. Some of you have written saying you missed the live stream of Alan Haber's interview with me on Pure Pop Radio. On the same night, Alan interviewed cult favorite rocker Jamie Hoover who produced most of the new album MAGELLAN WAS WRONG -- not to mention ALL the songs on the previous album FINDING YOU AGAIN. Jamie's interview adds a lot of insight into the making of the records. Now Haber has archived both interviews. Here they are. Just click on the link and wait like 30 seconds or so and they'll start playing like magic. These interviews are missing the songs, but my sense is that most of you have the album by this time so you know what the tunes sound like. New York, NY -- Continuing the worldwide centennial celebration for legendary entertainer Frank Sinatra, on September 23 2016, Eagle Rock Entertainment will release another suite of titles in The Frank Sinatra Collection. 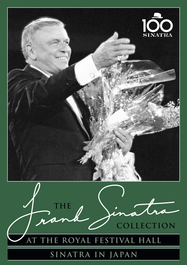 On license from Frank Sinatra Enterprises (FSE), the definitive collection pulls together some of the finest performances on television and in concert from the greatest entertainer of the 20th century. ‘Ol’ Blue Eyes Is Back’ was first broadcast by NBC on November 18, 1973 and marked Frank Sinatra’s return to performing following his “retirement” in 1971. The show, featuring special guest Gene Kelly, was filmed in front of a live studio audience but manages to retain an intimate concert feel. 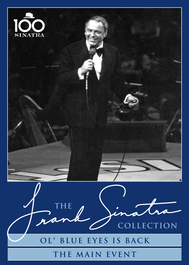 Sinatra gets us underway with the newly recorded song “You Will Be My Music” and performs a new routine with Gene Kelly to a medley taking in “Can’t Do That Anymore,” “For Me And My Gal” and “New York, New York.” The show closes with a reprise of “You Will Be My Music” to a standing ovation and Ol’ Blue Eyes is most definitely back. Filmed at Tokyo’s legendary Budokan on April 18, 1985, the ‘Sinatra In Japan’ show begins with a montage of stills and film clips while the orchestra perform a medley of classic Frank Sinatra tunes. Sinatra then takes to the stage with a rousing performance of “The Lady Is A Tramp” followed by many of his best-loved songs and biggest hits. First aired on December 20, 1957, ‘Happy Holidays With Frank & Bing’ is a timeless Christmas favorite featuring the magical combination of Frank Sinatra and Bing Crosby in an early color television special. The two legends swap Christmas carols, songs and stories, pay a musical visit to Victorian England and duet on some Christmas classics. The show finishes in inimitable fashion with “The Christmas Song” and “White Christmas” for pure festive perfection. The ‘Vintage Sinatra’ compilation DVD brings together black and white footage taken from Frank Sinatra’s television shows in the 1950s with color commentary and reminiscences from his three children: Nancy, Tina and Frank Sinatra Jr. 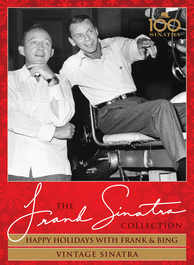 It features performances of many of Sinatra’s most popular songs including: “Come Fly With Me,” “I Get A Kick Out Of You,” “My Funny Valentine,” which he sings to a young Nancy, “I’ve Got You Under My Skin,” “The House I Live In” and many more, all set into context by the anecdotes of Nancy, Tina and Frank Jr. Packed with his incredible renditions of the songs that he made famous, The Frank Sinatra Collection is a treasure trove for any Sinatra fan.